BLAEU - Guiana sive Amazonum Regio. 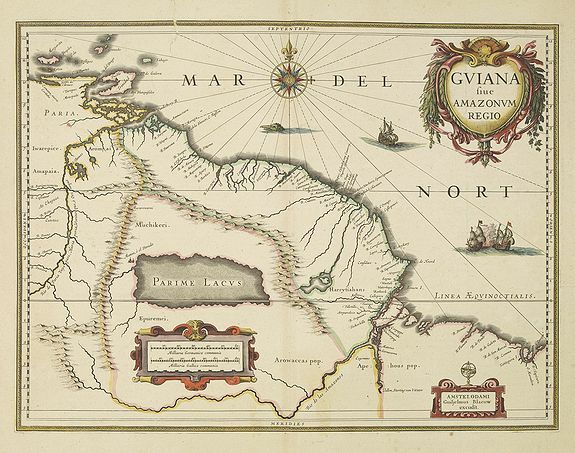 BLAEU, W. - Guiana sive Amazonum Regio. Guiana sive Amazonum Regio. - BLAEU, W.
Title : Guiana sive Amazonum Regio.. Description :Important map extending from the Isla Margarita in the northwest to the coast of northern Brazil near Sao Luis east of the Amazon delta. The map locates at its center a large inland sea, Parime Lacus, on whose northwestern shore lies the fabled city Manoa del Dorado, or the golden city of the Incas. The search for this city led many explorers, including Sir Walter Raleigh, on wild adventures through the jungles. The map is beautifully decorated with three cartouches, ships, sea battles, monsters and a fine compass rose. Koeman/V.d.Krogt, Atlantes Neerlandici, Vol.2, 112.2. Condition : Some very light staining in outer margin. Very good, near to mint condition. Printed on heavy paper. Very good and dark impression. French text on verso.